Naming family members in Chinese is complicated due to the Confucian emphasis on relationships and hierarchy. Chinese culture is traditionally hierarchical where member of a Chinese family has a unique title and has a specific place within the family. The different titles define a person’s position within the family. Chinese people hold the family bonds as sacred and honor them accordingly. Traditional, the man or the head of the family is responsible for earning the bread of his family. This responsibility also endows him with complete authority and the final say in the affairs of the family. The Chinese family roles have been influenced through the philosophy of Confucianism. In fact, the philosophy dictates how to choose a mate to dealing with your children. For example, you can see from the picture above that there are distinct terms for younger and older siblings as well as paternal and maternal grandparents. Having different titles also applies to extended family, such as aunts, uncles, and cousins. For example, while the term 姨妈 (yímā) refers to maternal aunts and 姑妈 (gūmā) refers to paternal aunts. 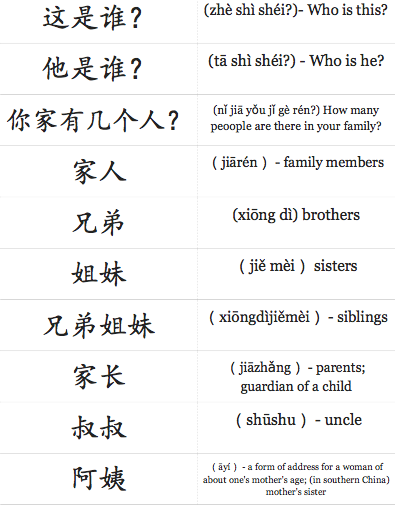 Learning family titles can be difficult when learning Chinese, therefore it is important to learn the main ones as shown in the additional vocabulary sheet for lesson 6. 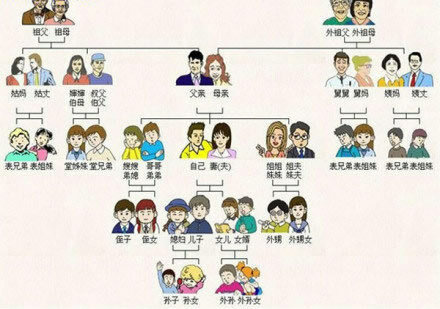 Remember, the different titles reflect the importance of clearly defining relationships within a Chinese family.